Ouargla is one of the wealth poles of Algeria and the richest energy towns in the country, where most of the big oil and gas companies are based. Yet, since February 2012 there has been growing discontent about the lack of jobs for local workers. The city of Ouargla is located 85km from Hassi Messaoud, one of the wealth poles of Algeria and the richest energy towns in the country, where most of the big oil and gas companies are based. Since 2012, only a few months after the start of the Arab Spring, there has been growing discontent about the economic marginalization and the lack of socio-economic development and infrastructure, despite it being the provincial capital to the oil and gas-rich area of Hassi Messaoud. Since then, protests have been led by the CNDDC (National Committee for the defence of the Rights of the Unemployed). In 2013, Ouargla was the site of the first move against the government's fracking plans. Protests were held for the several weeks in February 2 015. In the middle of the town's marketplace, a tent was erected as a centre for rallying opposition, holding debates and educational events. 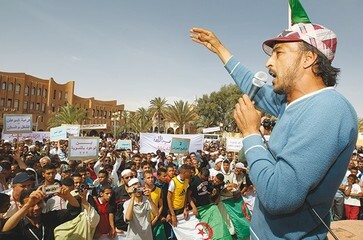 One of the slogans put forward by the people of Ouargla is: “The people declared a moratorium on shale gas”. Over the years, CNDDC was able to mobilise tens of thousands of people to join demonstrations, demanding decent jobs and protesting against economic exclusion, social injustice and the underdevelopment of the Ouargla region. While the protestors have been calling for a real job creation strategy, at times they have also worked closely with protestors from other sites, such as those fighting against the exploitation of shale gas in Ain Salah. As recently as February 2017, the CNDDC were mobilising for 10 days blocking access to the local job centre to protest clientelism and and special privileges that work to keep local workers out. Development of Alternatives The struggle has been for more jobs for the disenfranchised and economically disempowered youth as well as to confront the contemptuous authorities and challenge them in order to bring about justice. El Watan (2017). Ouargla : Les chômeurs exigent le départ du directeur de l’ANEM. 02 February 2017. Hamza Hamouchene (2016). The Struggle for Energy Democracy in the Maghreb. Rosa Luxemburg Stiftung.